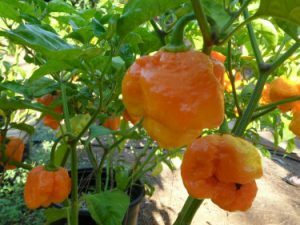 7 Pot Bubblegum-The 7 Pot Bubblegum was created by U.K. grower John Harper. 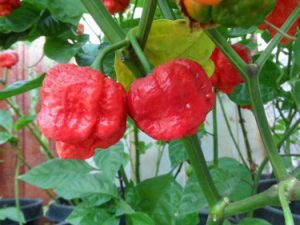 It is a cross between the Red Moruga Scorpion and the Yellow 7 Pot. 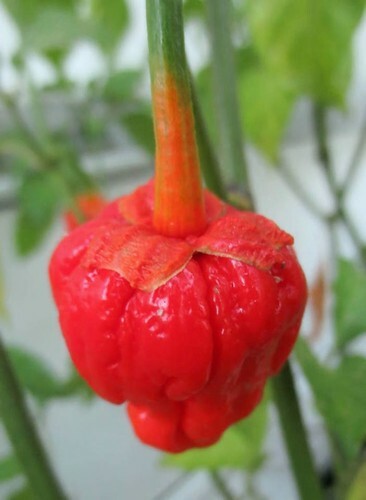 Called Bubblegum because color of pepper bleeds up the green stem it is attached to. It has a fruity flavor but is extremely hot!! Before you buy know that dried peppers are as much as 60% smaller than the fresh peppers. These are deseeded peppers. Even if we left seeds in they will die because we dehydrate at high temps that will kill the seeds but also bacteria. Facts you should know! Seeds do not contain heat! 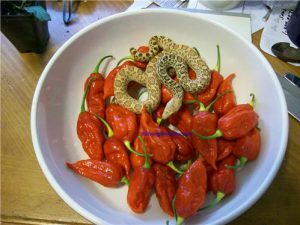 Seeds are bitter and take away from flavor of pepper. Heat is contained in placental tissue (inner skin) of pepper. We do not scrape this out. We leave it so you can experience the heat. Keep away from children and pets. Wash hands with cold soapy water. 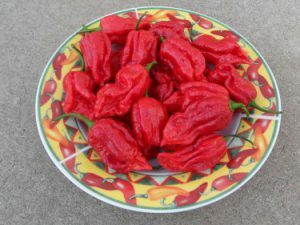 If you want to rehydrate to get moist pepper texture for cooking put in warm bowl of water for about 10 minutes. Or just add to your foods dried! These are for eating not to get seeds.